Sean Spicer is one of the most talked-about men in the country right now. His career has been full of ups and downs. And up until recently, Spicer was serving as a White House Press Secretary, as well as acting White House Communications Director for the Donald Trump Presidency. During this time he has come out with quite a few controversial statements in favor of this administration. His remarks have only fueled the war against media outlets, and Spicer’s press briefings have raised quite a few eyebrows. Here is one of them. 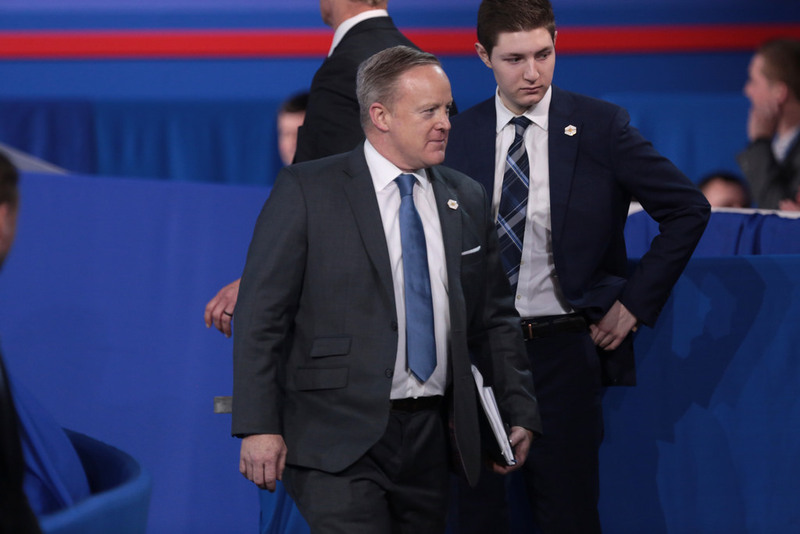 On Friday Spicer resigned his post as the White House press secretary after President Trump had appointed Anthony Scaramucci as the new communications director. Mr. Trump offered Scaramucci the post on Friday morning. Spicer was then asked to stay on as press secretary who would then report to Scaramucci. However, Mr. Spicer’s thoughts are that Scaramucci’s appointment will only make it more confusing for the general public. With the amount of uncertainty surrounding the White House at the moment, Spicer though it would only muddy the waters further. The information available for the news outlets and the public so far says that Sarah Huckabee Sanders will become the press secretary in Spicer’s place. Until now Sanders was Spicer’s highest ranking deputy, and it is not yet clear how well suited she is for the job. That will only be seen in a time when the press core of the White House returns to work as normal. This resignation has caused turmoil in the administration which has not been doing so well in the past two weeks. They have certainly had a lot on their plate since last week Senate was discussing the Health Care bill which has not yet been approved. Reforming Health care has been on the agenda ever since Mr. Trump and Mr. Spicer started their respective duties, but it doesn’t seem like there is a viable solution in sight just yet. Next week Donald Trump Jr. Mr. Trump’s son-in-law, Jared Kushner, have to testify before Congress about their connections with Russia and Russian political force. This is another controversial topic, as the administration has denied any possible ties, pointing fingers anywhere but at themselves. The outcome of these testimonies will be determined later in the year, but it will not be easy for this administration to regain the credibility it has lost with many people. However, those who support Mr. Trump’s way of leading, seem to be quite satisfied with the job he has done so far. Scaramucci is from Long Island and was a hedge fund manager. Currently, he works at the Export-Import Bank and he has a good relationship with Mr. Trump. It is clear, however, that Mr. Trump’s White House will be the same as before and Sean Spicer’s resignation will not change their attitude. Sometimes it can be tempting to just put on a pair of noise-cancelling headphones and ignore everything that is happening, but if you don’t like the way things are going in the country then it is important to get involved. Talk to your representatives, vote, volunteer. Folks, get your Twitter accounts and satiric websites ready: Donald Trump Jr. is getting ready to testify. Even our own website needed to be upgraded to a VPS server (using a discount code) after traffic around this story became insane. If your own website experiences a sudden spike in traffic, here are some coupons to keep the costs of upgrading down. Donald Trump Jr and a former campaign manager will testify before the Senate Judiciary Committee in a meeting scheduled for Wednesday, July 26. The two will testify on investigations of alleged ties between the Trump campaign and the Russian government. The biggest question is; will Donald Trump Jr be forced to testify in Russia probe? Kushner’s attorney has confirmed that his client is prepared to voluntarily co-operate and provide any relevant information. However, Trump Jr.’s attorney has failed to comment about the Judiciary Committee hearing. Both of them have received the invitations. It’s alleged that Trump Jr held a closed door meeting with a Russian lawyer, Natalia Veselnitskay at Trump Tower on June 2016. Other individuals in attendance were; Russian real estate company executive Ike Kaveladze and Russian-American lobbyist Rinat Akhmetshin. Trump Jr released a series of emails with information that the campaign would get high level, sensitive information. The emails further stated that was part of Russia and government support for President Donald trump. The statements have since put Trump’s son at the centre. The senate will try to dig out whether the Russian government played a key role in tilting the elections. Top Democrat Dianne Feinstein emphasized that the two should preserve relevant documents. Such documents include Trump campaign’s contacts with representatives of the Russian government. The New York Times has since published a report quoting the emails. Here is a closer look at the emails. Grassley told CNN that the Russian lawyer could have provided damaging information about Hillary Clinton. The chairman emphasized that he was willing to issue subpoenas to compel Trump Jr. to testify if necessary. FBI’s have started to conduct investigations on those people close to the president. At the same time, there are investigations on communication between publicist Rob Goldstone and Trump Jr. Goldstone was quoted saying a Russian government attorney would help him incriminate the democratic nominee. The committee is set to reach to anybody who had a contribution on the issue. Trump applauded his son transparency after he released emails about a meeting held at trump tower. NBC has held off-camera White House briefing where they deferred questions to Trump junior. The million dollar question is; will Donald Trump Jr be forced to testify in Russia probe? It’s still unclear whether he will testify before the Judiciary panel. An invitation is not a confirmation he will attend the meeting. The committee generally conducts open hearings. Close sources suggest that, President Donald Trump’s eldest son will not be forced to testify publicly. However, all eyes are set on that day.